Gondi is the lingua franca of the Maoist movement today, but All India Radio does not broadcast even a single new bulletin in the language. One winter morning, in Barwani district of Madhya Pradesh, I was watching a group of Adivasi kids peering into their mobile phones. The early morning sun was mellow, and they were so engrossed that they did not notice me drawing near. “We are doing Bultoo sir,” one of them told me when I asked what they were doing. It took me some time to understand that they were transferring audio and video files using Bluetooth technology in their mobile phones. I was in Barwani to take a class on citizen journalism with Adivasi children. Later, I discovered that more than 80 per cent of the students had Bluetooth in their mobile phones and actively use it to share audio and video files with each other. I had no idea that even my mobile phone is Bluetooth-enabled. I had never used it. On the other end of Central India, in Balrampur district, on the border of Chhattisgarh and Jharkhand, I found a similar phenomenon. It is a Maoist insurgency-affected district with a large proportion of Oraon tribals, who speak a language called Kuduk. An experiment here has thrown up a model for how to solve the problem. Eighty per cent of Balrampur’s gram panchayats are connected by optical fibre cables thanks to the Digital India push by Prime Minister Narendra Modi. The problem is, there is broadband but there isn’t much content in Kuduk on the Internet. The mobile phone is common in every household even in this remote Adivasi district. People earlier used it only to make calls. Now, they also use it to report on the happenings around them and to listen to the “Bultoo radio”. If wages under the Mahatma Gandhi National Rural Employment Guarantee Act (MGNREGA) haven’t been paid, if forest right deeds have not been distributed, they report about it in Kuduk. Once the messages get recorded on a central computer connected via the Internet, they also get translated into Hindi and English. Then it reaches officers such as Collector Alex Paul Menon, who was once abducted by the Maoists, and also reaches each gram panchayat. One person from each village comes to the gram panchayat office every day and downloads the daily programme of “Bultoo radio” on his mobile phone and shares it with all villagers upon return. The tradition of the International Fleet Review can be traced back to the Royal Navy from which independent India's navy adopted virtually all protocol, values, systems and ethos. Initially, it all began as a fleet review which is a 600-year-old British-introduced naval drill, a show of sea power, combat skill and battle readiness which goes back to the 15th century. However, the Royal Navy ensured that to do this there had to be a 'cause of action', an occasion, to celebrate and hold the fleet review, which in course of time became the International Fleet Review. Thus, when the Royal Navy-organized International Fleet Review took place on June 28, 2005, it was to commemorate the 200-year anniversary of the battle of Trafalgar of 1805, which saw a flotilla of boats on the river Thames. The queen of England sailed in a specially designed and decorated 'royal yacht' to review a fleet of almost 170 ships, included in which were vessels from over 30 nations. Before the 2005 event, however, there took place the queen's silver jubilee yacht review in 1977 and the International Fleet Review of 1999 to commemorate the battle of the Atlantic Ocean. To hold an International Fleet Review, the Royal Navy's code demands an occasion; a historic perspective on victory or a landmark anniversary pertaining to activities of the past of the nation and its navy. This cue from the British was also followed by the Royal Australian Navy when from October 3 to 11, 2013, it held an International Fleet Review at Sydney harbour as part of the celebration to commemorate the 100th anniversary of the entry of the first Royal Australian Navy fleet in Sydney on October 4, 1913. It was considered a milestone in Australia's maturity as a nation. Similarly, there earlier took place another fleet review in 1986 as the Royal Australian Navy's 75th anniversary and the bicentennial naval salute. The United States Congress is stalling efforts by the Government of Pakistan and the Obama White House to conclude the sale of eight F-16 jets to the Pakistan Air Force, the Pakistan-based Dawn newspaper reports. The Obama administration issued a formal notification of “Foreign Military Financing” in December 2015, which needs to be followed by a formal approval of a possible “Foreign Military Sale” to Pakistan by the U.S. State Department. However, even at that stage, U.S. Congress can still block the sale. The article goes on to cite statements by Congressmen Ted Poe and Dan Rohrabacher as evidence for the anti-Pakistan sentiment prevalent among U.S. lawmakers. Both lawmakers are members of the generally Pakistan-friendly Republican Party. However, U.S. lawmakers’ principal concern is that in reality the F-16s will not be used to battle militants within Pakistan but rather be deployed to deter India. In January 2015, Kurdish forces drove the so-called Islamic State (also known as ISIS) out of Kobani, a city previously considered to be one of the group’s strongholds. At the time, ISIS released an audio statement to restore the morale of its beleaguered fighters. In it, spokesman Abu Muhammed al-Adnani reassured ISIS foot soldiers that the group was “becoming stronger and stronger” and “taking confident steps with no doubt or hesitation.” Adnani then dropped a bombshell: ISIS had added Wilayat Khorasan—a territory encompassingAfghanistan and Pakistan—to its growing list of international outposts. Since the establishment of Wilayat Khorasan, Afghanistan has become central to ISIS’ campaign for global expansion. But challenges in Afghanistan have plagued the group from the very start. After more than two decades of conflict, the Taliban is deeply entrenched in Afghanistan’smilitant communities. As an indigenous force, it can draw on tribal relationships and ethnic loyalties, an inherent advantage over ISIS. And although the Taliban may not be particularly savvy on social media, the group understands the needs and desires of Afghanistan’s jihadists in ways that ISIS can’t. As part of the current reorganization of the Chinese military the Second Artillery Corps, which consists largely of short range ballistic missiles plus fewer than a hundred longer range (strategic) missiles, is being upgraded to the new Rocket Force. That means this organization goes from being part of the army to being a fourth branch of the military (along with the army, navy and air force). Because the Rocket Force controls China’s nuclear weapons it has the most firepower of any branch but the fewest personnel. This combining ballistic missiles under one organization is similar to what the Russians did throughout the Cold War. The Russians, like the Chinese now, made their nuclear missile force a brach of the armed forces. The Rocket Force is spread over most of China, has about 100,000 personnel and is organized into six “Missile Divisions” which have between them over 30 missile brigades. The most common ballistic missile is the DF-21 and the ten DF-21 brigades each have up to six missile battalions (with two mobile launchers each), two maintenance and repair battalions, a site management battalion, a signal battalion and an electronic countermeasures (ECM) battalion. The basic DF-21 is a 15 ton, two stage, solid fuel missile that is 10.7 meters (35 feet) long and 140cm (4.6 feet) in diameter. Range varies (from 1,700-3,000 kilometers) depending on model. These missiles are carried and launched in TELs (transporter erector launcher vehicles). The Second Artillery Corps also controls most of China’s nuclear weapons, although many of the smaller ballistic missiles also have non-nuclear warheads available. The Rocket Force also controls the new ballistic missiles for nuclear submarines. In 2014 China revealed (apparently by accident) the existence of the DF-26 IRBM (Intermediate Range Ballistic Missile.) This one appears to have a range of 3,500 kilometers and based on the earlier DF-21. There have been reports of such a missile since 2007 and the DF-26C appears to have been in service for several years. The DF-26C is notable because it has the range to hit American military bases on the Central Pacific island of Guam. China's military may send troops to join the global conflict against Islamic State terrorists, according to defense officials. "The real question is whose side will they be on," said one defense official familiar with internal discussion of the Chinese military role. Rather than cooperating with the U.S.-led military coalition now operating against the Islamic State in Syria, Iraq and other locations, the Chinese military is more likely to join forces with Russia's military, currently engaged in a large-scale bombing campaign in Syria. Islamic State militants issued a video from Syria in July calling on China's Uighurs to take up arms and join the Islamic State in territory the group controls in Syria and Iraq. It was the first time the Islamic State publicly appealed to Uighurs. China has used its counterterrorism rules to crush not only Islamist terrorists but also dissident Uighurs and others who are seeking independence from Beijing. China's communist government announced new counterterrorism regulations in December that permit overseas activities. On Wednesday, Beijing released a government paper calling for closer defense and military cooperation in the Arab world against terrorism. Ayman al Zawahiri discusses Southeast Asia in episode eight of al Qaeda’s “Islamic Spring” series. Al Qaeda’s propaganda arm, As Sahab, has released three new messages from Ayman al Zawahiri. Two audio messages and a 7-page statement from the al Qaeda emir have been disseminated online in the past day. The first audio message, titled “Al Saud, Murders of the Mujahideen,” is just over seven minutes long. Zawahiri encourages the Saudi people to rise up against their monarchy and criticizes the Saudi government’s execution of more than 40 prisoners earlier this month. The al Qaeda chieftain claims the “murders of more than 40 mujahideen” and Nimr al Nimr (a prominent Shiite cleric) were really intended to serve the interests of America and the “Crusaders.” The “mujahideen” Zawahiri refers to include a number of al Qaeda operatives, including jihadists who were accused of launching a series of attacks inside the kingdom beginning in 2003. Zawahiri’s message is preceded by a clip of a talk given by Anwar al Awlaki, an al Qaeda in the Arabian Peninsula ideologue who was killed in a US drone strike in 2011. The clip is intended to emphasize the importance of martyrdom in the wake of the Saudi government’s executions. 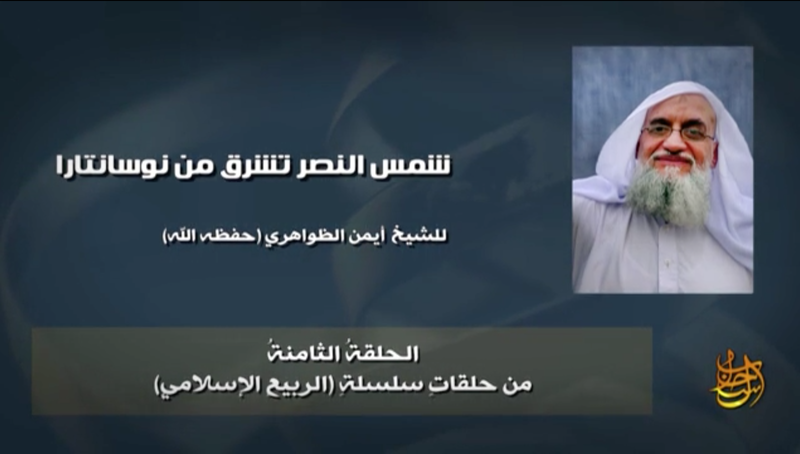 The clip ends with Awlaki saying: “Hence, the tree of martyrdom in the Arabian Peninsula has already got ripened fruits on it and the time for reaping them has come, so the Almighty Allah took from among those martyrs.” Although these words were spoken long before Saudi Arabia’s executions earlier this month, they are used in the new audio message to explain the supposed value of al Qaeda’s martyrs. After an explosive 2015, Moscow looks to the year ahead. Moscow’s activity in the Middle East has been on the rise in recent years, but its decision in late September and early October to strike in Syria came as a shock to many. The Kremlin used its air and missile operations—carried out with sophisticated weaponry and in an impressive manner—to demonstrate that Russia is a modern military superpower with a global reach. Whether Russian covert operations for Assad’s army or the 5,240-plus mission flights it has launched—including 145 flyouts of strategic missile-carrying and long-range bomber aviation—were game changers on the ground is still an issue that isdebated even within the Russian expert community. Nevertheless, Moscow’s coordinated efforts with regional governments, as well as targeted strikes on key assets of terrorist and rebel groups, accomplished two politically important objectives for Moscow. First, they pushed all the interested players to deal with the Kremlin, which can no longer be treated as “isolated.” Some, such as the Gulf states and Syrian opposition groups, criticize Moscow sharply in public but continue to work behind the scenes through multiple channels. This trend will likely continue to develop as Saudi Arabia becomes one of Moscow’s major Gulf negotiating partners. Others, like the Obama administration, while continuing to disagree on President Bashar al-Assad’s role in the Syrian conflict, have cooperated with the Kremlin on technical issues and matters of mutual security. For instance, even though a confrontational spirit still dominates the relationship, Moscow and Washington are now actively involved in sorting out the groups that should be blacklisted as terrorist from those that can become a part of a future political process in Syria. Second, Moscow’s actions have managed to shift some Western elites’ perception of Assad, especially when contrasted with the rapidly growing threat of the Islamic State. While the Paris atrocities and the shootings in California helped make ISIS the primary concern, Moscow’s military operations in Syria firmly positioned the Kremlin as a leader in the anti-ISIS campaign. It has become clear that including Russia is far more profitable, both politically and operationally, than marginalizing it. By Lisa Curtis, et al. In just two years—from fall 2013 to fall 2015—ISIS established a presence in at least 19 countries. With a slick and sophisticated Internet and social media campaign, and by capitalizing on the civil war in Syria and sectarian divisions in Iraq, ISIS has been able to attract more than 25,000 fighters from outside the Islamic State’s territory to join its ranks in Iraq and Syria. These foreign fighters include over 4,500 citizens from Western nations, including around 250 U.S. citizens who have either traveled to the Middle East to fight with extremist organizations or attempted to do so. The civil war in Syria has been the main catalyst for young people to leave their home countries and join ISIS to fight the regime of Syrian dictator Bashar al-Assad. Failure of Western nations to respond to incidents like Assad’s 2013 chemical attack on civilians facilitated ISIS recruiting. Unexpected ISIS success in Iraq, where, in June 2014, it captured Iraq’s second-largest city, Mosul, and ISIS leader Abu Bakr al-Baghdadi’s declaration of a caliphate that same month, has further accelerated the flow of fighters to the region. ISIS’s unprecedented success in recruiting fighters from around the world has been its ability to convince impressionable young Muslims of a civilizational struggle between Islam and the West, making it the duty of all Muslims to join the war. In this Heritage Foundation Special Report, a team of experts on counterterrorism, global Islamist trends, and specific regions detail a multi-pronged, and international, approach to cutting off the flow of foreign fighters to the Islamic State. The Islamic State’s recent global terror campaign—including the October 31 downing of a Russian passenger jet that killed 224 and the November 13 shooting attacks in Paris that killed 130 restaurant patrons and concert-goers—has increased the urgency for the U.S. to lead a global alliance to defeat the Islamic State and its ideology. ISIS has also been able to establish a presence in at least 19 different countries within the past two years, even in places where its competitor, al-Qaeda, has been operating for years. With a slick and sophisticated Internet and social media presence, and by capitalizing on the civil war in Syria and sectarian divisions in Iraq, ISIS has been able to attract more than 25,000 fighters from outside ISIS’s territory to join its ranks in Iraq and Syria. It was an unseasonably warm afternoon in Ukraine on Dec. 23 when the power suddenly went out for thousands of people in the capital, Kiev, and western parts of the country. While technicians struggled for several hours to turn the lights back on, frustrated customers got nothing but busy signals at their utilities’ call centers. Almost immediately, Ukrainian security officials made claims about the cause of the power failure that evoked futuristic concepts of cyberwar. Hackers had taken down almost a quarter of the country’s power grid, they said. Specifically, the officials blamed Russians for tampering with the utilities’ software, then jamming the power companies’ phone lines to keep customers from alerting anyone. Hacking a power grid: It sounds like the kind of doomsday scenario experts in the U.S. and Europe have warned about for years. “Imagine if someone shut down the power to New York’s traffic grid during rush hour,” says Tony Lawrence, chief executive officer of cybersecurity firm VOR Technology. “Cyber attacks against public utilities systems could have disastrous effects.” But the cybersecurity researchers investigating the power failure now say it’s clear this wasn’t the kind of sophisticated attack that could fell the U.S. in 15 minutes, as former White House counterterrorism chief Richard Clarke famously predicted. The Ukrainian hack knocked out at least 30 of the country’s 135 power substations for about six hours. Cybersecurity firms working to trace its origins say the attack occurred in two stages. First, hackers used malware to direct utilities’ industrial control computers to disconnect the substations. Then they inserted a wiper virus that made the computers inoperable. Several of the firms researching the attack say signs point to Russians as the culprits. The malware found in the Ukrainian grid’s computers, BlackEnergy3, is a known weapon of only one hacking group—dubbed Sandworm by researcher ISight Partners—whose attacks closely align with the interests of the Russian government. The group carried out attacks against the Ukrainian government and NATO in 2014. The wiper virus was last seen in attacks against journalists covering local elections in Ukraine in October. “The targets are definitely in line with Russian geopolitical interests,” says John Hultquist, ISight’s director of cyber espionage analysis. Russian-backed separatists demonstrated the Kremlin’s continued capability to escalate offensive operations in eastern Ukraine with a tactical advance into the uncontrolled village of Kominternove despite its intervention in Syria. An armored group of roughly 100 Russian-backed separatists seized the village on December 22. Kominternove lies ten kilometers outside the key Ukrainian port city of Mariupol. Separatist forces reportedly launched the operation as retaliation for Ukraine’s occupation of at least two uncontrolled villages east of Mariupol in early December, a move which both Russian and separatist officials claimed could lead to a resumption of hostilities. The advance of separatist mechanized units toward Mariupol is a direct violation of the most recent withdrawal agreement between Ukrainian and Russian-backed forces signed in September. Ukrainian authorities called the occupation of the village a large-scale provocation. The Ukrainian military has reported several incidents of shelling from the separatists’ new positions around Kominternove on the neighboring uncontrolled village of Vodiane, located three kilometers closer to Mariupol. These advances underscore the potential for further separatist activity around the strategic port city, targeting weakly defended or uncontrolled villages between Ukrainian and separatist lines. The separatist advance into Kominternove gives the Russian-backed forces the ability to launch indirect fire on the outskirts of Mariupol with lighter weaponry, including mortars. This may hold tactical significance, enabling the separatists to project force against Ukrainian defenses around the city without launching a high-profile rocket artillery attack. The occupation of Kominternove, however, is not likely the precursor to a major offensive in the near term. Ukrainian forces have fortified Mariupol with a network of trenches, barriers, and mines, obstructing a direct Russian-backed separatist assault on the city from the east. Russian-backed forces would likely intensify operations near Mariupol and across the front line prior to an offensive on the port city, testing government defenses with probing maneuvers and bombarding Ukrainian positions with heavy artillery. Russian-backed forces would also likely seek to outflank heavy Ukrainian defenses east of Mariupol by seizing strategic terrain to the north of the city along the Donetsk-Mariupol highway. 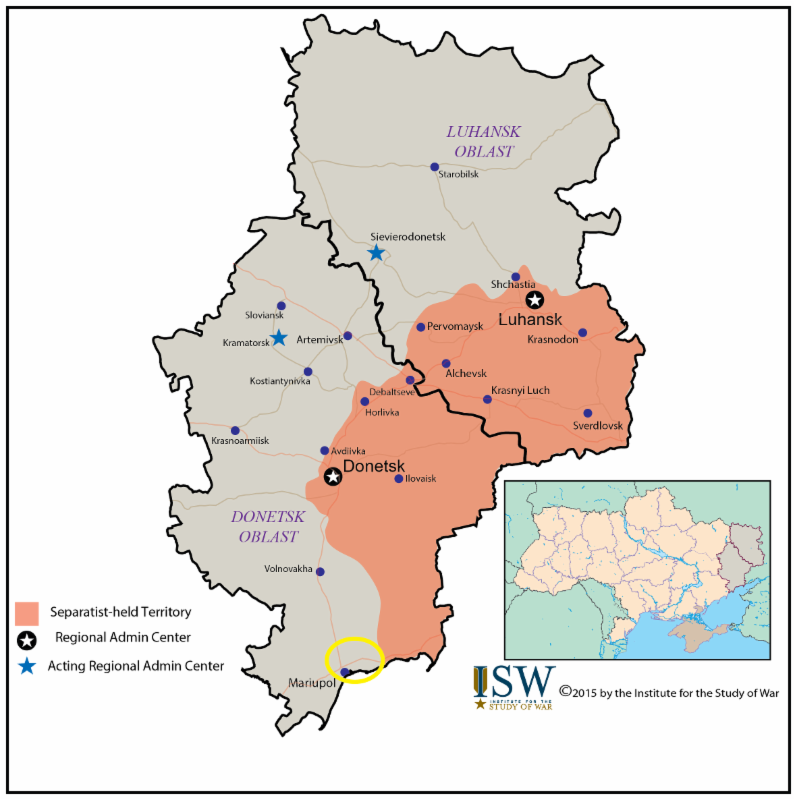 Although Russian-backed separatists now have the ability to threaten a strategic Ukrainian city with a wider array of weapons, they have yet to trip several indicators that would signal a looming large-scale offensive. Russian media outlets are running stories saying that the Russian Strategic Missile Force is going to keep itself busy in 2016, carrying out a total of 16 intercontinental ballistic missile tests. This poses a few obvious questions: Is that a lot of tests? Are we all going to die? Do I need to start digging a bomb shelter in my backyard right this instant? The answers are, respectively, yes, no, and it’s complicated. First off, 16 tests of intercontinental ballistic missiles, or ICBMs, is a lot. Last year, Russia conducted eight, and doubling a nuclear missile test program is kind of a big deal. Of the planned 16 tests, 14 will be for new systems, while the remaining two launches are meant to test extending the life of existing missiles. What, then, are the Russians testing? Well, they’re testing road-mobile missiles, submarine-launched missiles, and beginning the test program of their new heavy ICBM, which NATO calls the SS-X-30 Sarmat. “The missile is in early phases of development and engineering,” said Hans Kristensen, director of the Nuclear Information Project at the Federation of American Scientists. There’s a lot of really weird psychology and game theory at work when you start talking nuclear deterrence, but one thing that creates huge amounts of angst among people in charge of nuclear armaments is, basically, performance anxiety. Nuclear deterrence is built on the idea that even if you get a jump on me and take me down, you’re still going to get taken out by that vicious response I’ve kept in storage just for that occasion. The sweet spot for avoiding nuclear apocalypse is when both sides have enough nuclear capability to ensure their retaliation will have full effect — but without having so much strike capability that it creates a fear in your opponent that the other guy can get enough of a jump on you to take both you and your retaliatory ability out in one fell swoop. If both sides think they have a strong second-strike ability, but know that their first strike would not totally obliterate the opponent, then everybody is going to just chill. According to Jeffrey Lewis, a big nuke wonk at the Center for Nonproliferation Studies, of all the kinds of nuclear sneak attacks, Russian leaders live in perpetual fear of a decapitation strike. Kinda like it sounds, a decapitation strike kills all the top bosses, so that there’s nobody around to send the signals or release the launch codes for the retaliatory attack. January 13, 2016: At the end of 2015 a number of very senior Indian officials went to Russia to meet with their counterpartsthere and one items at the top of the agenda was the continued reliability problems with the Su-30MKI jet fighters. Fifty of these Russian designed aircraft were built in Russia for India and the rest of the 272 aircraft order is beingassembled locally. Deliveries should be complete by 2019 and at the moment India is not keen on ordering any more. There is a reason for that. India has been complaining out about these reliability problems since 2010 and the most telling statistic is the percentage of Su-30MKIs out of service for maintenance or repairs. Russia promised that this would only be about 25 percent, which is competitive with similar Western aircraft. India points out that in reality between 40 and 45 percent of the Su-30MKIs are out of service, many for reliability problems that Russia assured India would not happen. The impact of this lower availability means that of the 210 Su-30MKIs India has only about 126 are available to fight rather than the 157 Russia promised. That means 31 fewer Su-30MKIs available to use in wartime. That is a significant loss and India is demanding a solution. Most of the problems are related to engines and Russia says it has narrowed most of the problems down to difficulties related to ball bearings. The engines are also assembled in India, using Russian and Indian made parts. Russia has devised several fixes for theengine problem but the readiness (for combat) rate of the Su-30MKI has not changed. India is demanding that Russia allow Indian firms to manufacture many more spare parts. Russia does not like to do that because spare parts are more profitable than the aircraft. The Indian Air Force has lost five of its Russian designed Su-30MKI jet fighters since 2009. In 2011 the commander of the Indian Air Force took an hour-long flight in one of India's Su-30MKI to reassure Indian pilots that the Su-30MKI was safe. Two had crashed in 2009, due to mechanical failures and there were widely publicized reliability problems with the engines and many of the other Russian designed and built components of the aircraft. There have been two losses since 2013. MOSCOW, January 12. /TASS/. Three new west-oriented divisions will be formed this year, Russian Defense Minister Sergey Shoigu has said. “I cannot but mention such an important task as the formation of three west-oriented divisions. The task is extremely important,” he said. Read also Russia to build up strength of missile forces, artillery by 2021 — Defense Ministry Defense minister: About 30 army units formed in Russia’s Western Military District in 2015 Russian Defense Ministry is forming new armies New Air Force and Air Defense Army in Russia’s East to protect over 22,000 km border Tank army to be formed near Moscow by wintertime — source Shoigu added that alongside manning the three divisions the related program was expected to create permanent infrastructures, test sites, military hardware depots and barracks. Last autumn Shoigu said that since the beginning of 2015 about 30 units and forces had been created in the Western Military District. And at the end of November he declared that fifteen units had been created in the Southern Military District and the establishment of two more units was in the final phase. According to earlier reports, the Western Military District had been reinforced with a newly-formed 1st tank army, headquartered near Moscow. A senior source in the General Staff told TASS the 20th general purpose army in the district had to be created from scratch, as most of its original forces had been handed over to the 1st tank army. The 20th army is to be stationed in five regions in the west of Russia. Its headquarters are Voronezh. As I once again prepare to attend the World Economic Forum at Davos next week, I wear the Indian mantle with greater pride than ever before. If we consider the question ‘is there a cure for the world's economic malaise’, it is evident that every country must work hard to find its own answer, as India surely has. Even among the original four BRICs, all but India have started to run low on growth gasoline amid the worldwide slump in commodity prices and lethargic gains in the West. As our Central Bank Head Raghuram Rajan states - while fellow BRICs have deep problems, India appears to be ‘an island of relative calm in an ocean of turmoil’. There is a sense of heightened optimism in India as it pulls away from the Wolf Pack to become the world’s fastest-growing economy. India’s growth accelerated to 7.4% in the Q2 of 2015-16, riding high on manufacturing and investment pickup. Foreign Direct Investment (FDI) grew by 27 per cent in 2014-15 to USD 30.93 billion. From April-September 2015, FDI in India increased by 13% and reached USD 16.63 billion over the USD 14.69 billion in the same period last year. Deftly catching the upswing, the Indian government relaxed FDI norms in 15 sectors including defence, real estate, retail and civil aviation. In real estate, investments in the first half of 2015 almost equalled the entire investments in 2014 - and far exceeded those of 2013. On the transparency front, India is likely to enact the Real Estate Regulation Bill soon, and it also finally introduced Real Estate Investment Trusts (REITs) last year. WASHINGTON, January 13, 2016 – A new World Bank report says that while the internet, mobile phones and other digital technologies are spreading rapidly throughout the developing world, the anticipated digital dividends of higher growth, more jobs, and better public services have fallen short of expectations, and 60 percent of the world’s population remains excluded from the ever-expanding digital economy. Although there are many individual success stories, the effect of technology on global productivity, expansion of opportunity for the poor and middle class, and the spread of accountable governance has so far been less than expected. Digital technologies are spreading rapidly, but digital dividends – growth, jobs and services – have lagged behind. January 13, 2016: The widespread adoption of the Internet since the 1990s has had some unexpected side-effects. For example it has become much more difficult to confirm casualty figures in most wars today because the violence has become increasingly intolerant of journalists. Before the Internet it was different with all sides in wars eager to get their version of the story out and that meant tolerating the presence of journalists. But with the Internet you don’t need journalists present in the combat zone. In fact those reporters are often a liability as they tend to report what is really happening rather than the version each side prefers. The Internet has become the mass media for Islamic terrorists. This was not obvious to Islamic terrorists right away. Initially Al Qaeda found it had little success using the Internet to influence people who are not already fans of Islamic terrorism. Most Moslems will at least read Internet postings by Islamic terror organizations, but the real power of the Internet proved to be as a means attracting and regularly communication with the small community of Moslems who do support Islamic terrorism. This is a big help for recruiting, fund raising, and organizing attacks and other atrocities. Using the Internet is not without its dangers. Most Islamic terrorists are Arabs and Arabs have a thing about telling, creating, and believing outrageous rumors. Some counter-terror organizations took advantage of this by taking seemingly plausible, scary, and damaging (to terrorist operations) stories they found on the net and spreading them among a large number of pro-terrorist web based groups. This is disinformation, and is an ancient technique. Ancient scriptures mention its use. The new wrinkle here is that the counter-terror organizations that are monitoring terrorist, or pro-terrorist web sites, chat rooms and listservs, note those bits of scary misinformation that seem to be the most popular. Sometimes calling in an Internet expert, the counter-terror people cook up even scarier variations on the initial rumor, and make sure all of them get spread around as much as possible. The Islamic terrorists and their fans have a hard time doing this, because many of the Islamic terrorist meeting spots on the web are kept secret, lest they be discovered by security officials and shut down. But most major Western intelligence agencies have an extensive list of these sites, a larger list than any Islamic terrorist has. New discoveries are shared among different countries, and when a particularly exploitable new rumor shows up, it gets a boost from the infidels. Any discussion regarding the Army’s approach to talent management often produces the wailing and gnashing of teeth akin to a Wagnerian opera as a deluge of ideas struggle to find a balance point, crafting a promotion system that retains the best talent while also allowing additional time for those officers who need to grow professionally. In “Can the Military Halt Its Brain Drain?” Lt. Gen. David Barno and Nora Bensahel cite a 2010 Army study that revealed that only 6 percent of surveyed officers believe the Army does a good job of retaining the best leaders. While civilian firms continue to innovate new approaches to talent management, the authors assert that the Army is unable to become a “camouflaged version of Google or Facebook” as long as it sustains an industrial approach to officer promotions that is inadequate for talent management and retention. To be sure, the U.S. Army’s size, its unique requirements, and a host of other factors mean that it cannot adopt Silicon Valley approaches wholesale. But equally, to suggest that its bureaucratic mechanisms can never be reassessed and updated risks not only driving further dissatisfaction within its ranks, but eroding its mission effectiveness, as well. While Barno and Bensahel’s article stops short of describing a Götterdämmerung-like crisis, their call for reform is warranted when one realizes that the Army promotion system uses time as the single criterion for deciding when to evaluate an officer’s potential to serve at the next level. Because the current system assumes that all officers require the same amount of time to develop professionally, exceptional leaders are forced to travel at the same pace as the rest of the herd. Therefore, I argue that the promotion system should consider officers for advancement to the next rank as soon as they complete the critical assignments, or key development billets, of their current grade — making it easier for the Army to more quickly and efficiently get the most qualified officers into the positions where they are most needed. A simple change in promotion board timing could go a long way toward retaining the talent the Army needs. Clearly, the Army is unable to offer the same incentives that the private sector uses to prevent top performers from gravitating to a competitor. Stock options and performance bonuses conflict with the Army’s values for a number of practical and ethical reasons. However, the Army is not totally without options for better talent retention. By slightly altering its promotion system to prioritize professional accomplishments rather than solely time in grade, the Army would stand a better chance of advancing — and keeping — its best officers. BlackBerry’s are famed for their security — even President Obama uses one. But police in the Netherlands allege that they are able to intercept and decrypt emails sent on some PGP BlackBerry phones — a type of BlackBerry that comes with PGP encryption software pre-installed by third-party vendors. “We are capable of obtaining encrypted data from BlackBerry PGP devices,” a spokesperson for the Netherlands Forensic Institute (NFI) said to Motherboard. Motherboard’s report was based on an earlier story from the Dutch site Crime News. The site apparently got hold of documents from the NFI, which say that the crack was able to open 279 of 325 encrypted emails it was tried on. Law enforcement apparently needs physical access to the phone for it to work. BlackBerry is telling news outlets that it needs more information about the alleged crack. “We are confident that Blackberry provides the world’s most secure communications platform to government, military and enterprise customers,” it said in a statement. Tech news site The Register is speculating that the alleged crack is down to a problem with the third-party vendors. You can buy BlackBerrys with PGP pre-installed, and it might be that it was incorrectly installed — leading to an exploitable vulnerability. If that’s the case, then the third-party vendors have screwed up and BlackBerry isn’t to blame, and its core software hasn’t necessarily been compromised. Whatever the answer, Obama can probably breathe easy — he uses a custom BlackBerry with a host of secure features developed with the help of the NSA. It’s time for Corporate America to take a closer look at a serious problem. Nearly every week, it seems like hacks dominate the headlines: TalkTalk, Ashley Madison, Anthem ANTHEM 0.00% , Target TGT -0.47% , Sony SNE -3.86% , and the federal government have all been recent targets. Organizations are increasingly engaged in a cyber war with adversaries ranging from organized crime rings to nation-states and online vigilantes. These outsider attacks generate substantial public and private anxiety, and with good reason: the loss of sensitive customer information, disruption of services, and negative headlines can shake the confidence of shareholders, employees, and customers. But there’s another risk, equally if not more pernicious, that often goes overlooked: insider attacks. Many executives don’t fully appreciate that their biggest risk can come from within. Malicious internal actors can endanger not only a company’s financial and reputational health, but also the physical safety of their staff. Recent events—multi-million dollar employee fraud, high-profile intellectual property theft, and the attacks in San Bernardino— have made it clear that events like the Edward Snowden data leaks or the Washington Navy Yard shootings were not anomalies. Organizations can and should formally address insider risk through the creation of a program that progresses it from mitigation to prevention. Innovative technology can help organizations proactively screen and detect bad actors before they strike, but implementing these solutions requires commitment from the highest level of leadership in both the public and private sectors. Sisyphus: Punished by the Greek Gods to roll a giant boulder up a steep mountain, and upon reaching the top, watch it roll down to the bottom again… and again… and again. The following guest post was provided by Major Ed Arntson, an active duty Infantry officer currently stationed at Fort Hood, Texas. He is a graduate of Concordia College in Moorhead, MN, the Command and General Staff College, and the School of Advanced Military Studies (SAMS). The views contained within this article are his own and do not reflect the views of the Department of the Army or the Department of Defense. As Super Bowl 49 drew to a close a couple of weeks ago and the New England Patriots began to celebrate their fourth Super Bowl championship in the last fourteen years, an interesting thought occurred to me — ‘so that’s what it’s like to win, and win big.’ The Patriots have won three of those Super Bowls since I've been on active duty in the Army, and in that time, I've deployed to combat four times — but I never celebrated a victory — and there’s a chance that I never will. During the Super Bowl, the commentators extolled the work ethic of Tom Brady, Julian Edelman, and Russell Wilson, among others, on both teams. “Julian Edelman shows up to the facility at 5 a.m. every day during the season,” commented NBC’s Chris Collinsworth. That’s great. I show up for work at 5 a.m. 330 days out of the year. So do a lot of other hard working people in the Army. The intent here isn't to compare professional sports to the work we do in the U.S. Army, it is meant to demonstrate how frustrating it is to work hard at something for a long time, and not experience a lasting, irreversible victory. Women have long been an integral part of the U.S. military, having performed admirably—in some cases, heroically—in Operations Iraqi Freedom and Enduring Freedom. Over the past month and a half a succession of some of the nation’s most powerful civilian and military leaders have lauded the recent decision to remove all restrictions on what jobs women can fill in the U.S. Armed Forces. Lifting the ban, they say, will make the military stronger. They are wrong. The very best outcome we can hope for is that the Armed Forces’ abilities will remain static. The most likely outcome, however, is that there will be some degradation in the units that are charged with some of the most critical roles: closing with and destroying enemy forces. Lifting the restrictions was, no doubt, designed to elevate the stature of women and give them an opportunity in the military equal with men. The result of the move, unfortunately, is likely to be that we’ll place women at a disadvantage and put them in a danger greater than that faced by men in combat. President Obama commended theDecember 3 decision by Secretary of Defense Ash Carter to open all combat jobs to women. He said that, as commander in chief, he knows “this change, like others before it, will again make our military even stronger.” Echoing that sentiment, Secretary of the Navy Ray Mabus argued that lifting the ban is “not going to make [the U.S. military] any less fighting effective. In fact I think they will be a stronger force, because a more diverse force is a stronger force.” Evidence, logic and experience says these hopes will not be realized. Approximately 90 percent of all military occupations have already been open to women for quite some time. The 10 percent of the jobs that have been restricted to men-only were the frontline, direct combat roles requiring significant physical strength such as infantry, artillery and armor. In determining if this restriction has unfairly prevented women from filling those roles, it is instructive to examine comparisons to other male-only organizations.